The Millennium Stadium will be renamed the Principality Stadium in a 10-year sponsorship deal with the Cardiff-based building society. 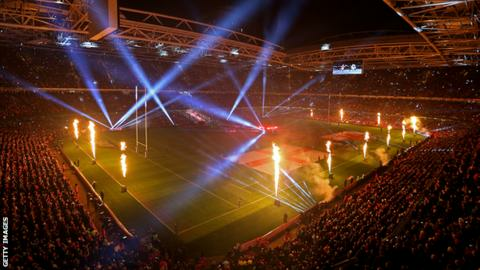 The new name for the 74,500-seat capacity stadium, the home of Welsh rugby, will be used from January 2016. It was built at a cost of £121m to replace the National Stadium, Cardiff Arms Park, for the 1999 World Cup. The structure, owned by the Welsh Rugby Union, is famous for having the only fully-retractable roof on a UK stadium. Its construction was funded to the tune of £46m by the Millennium Commission, which resulted in its original name. As well as hosting the FA Cup finals from 2001-06, the stadium has staged rugby and football internationals, major concerts by artists like U2 and the Rolling Stones and has been selected to host the 2017 Uefa Champions League final. The first match to be played under the new name at the stadium will be Wales' Six Nations game with Scotland on Saturday, 13 February. WRU chairman Gareth Davies said: "Both parties are comfortable with the arrangement. I think a 10-year deal is significant in terms of naming rights for a stadium." In its last financial accounts in 2014, the WRU's debt stood at £15m. That figure was once £75m as a result of the stadium's construction costs.